A musician, dancer, singer and caller, he has been a member of different bands with whom he toured extensively in North America and in Europe : Éritage, Ad vielle que pourra, Hommage à Alfred Montmarquette, Bourque et Bernard, Matapat, Le Vent du Nord, are all bands that enjoyed his talents and his exceptional charisma. Specialist of Quebec tradionnal dances, Benoit has presented lectures and workshops in many camps and festivals, showing his skill in step dancing and bones playing (wich is a family tradition: his dad and grandad were both bones players). 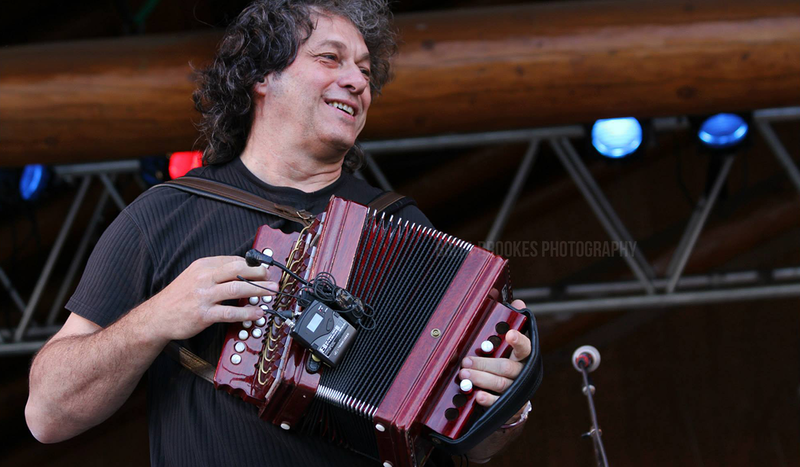 A founding member of Le Carrefour mondial de l’Accordéon, in Montmagny (Québec), he emcees both the outdoor concerts at Parc de la Mairie and the night concerts at the concert hall since 15 years. Selected artist for the ‘’Artists in School’’ Program, a partnership in between the Ministère de la Culture et des Communications and the Ministère de l’Éducation du Québec, this program gives an oportunity to youg students from pre-elementary, elementary and high school students to have an access to arts and culture. Since 2007, Benoit has also been involved in Music Therapy programs where he devotes several hours a week helping elderly, physically disabled and mentally challenged people experience the same joy he does learning, playing and enjoying music. Since November 2008, he is a member of La Bottine Souriante. 2004 : JUNO Award for ‘’Best Traditionnal Album/group’’ (with Le Vent du Nord). 1988 : Public’s Choice at the Moscow International Folklore Festival.